Princess Cruises, the cruise line made famous as the backdrop of the iconic Love Boat television series, debuted a new cocktail today in time to sweeten Valentine’s Day celebrations on the high seas. Original Love Boat cast member Ted Lange, who played Isaac the bartender, created the amorous concoction, drawing inspiration from his character’s signature grin-and-point move and bright red jacket. The new drink is debuting on all Princess cruise ships in time for Valentine’s Day. Fittingly called, “The Isaac,” the refreshing love potion includes white rum – a nod to Lange’s favorite cruise destination, the Caribbean; pomegranate syrup – channeling the famous red jacket his character wore and also an aphrodisiac; two pineapple leaves as garnish – tribute to his character’s two-finger signature point; lime juice and club soda, to add some sparkle. Lange recently visited Crown Princess to demonstrate how to make his new creation for the ship’s bartenders and a video of this lighthearted demonstration can be seen here. “The Love Boat put Princess Cruises on the map, bringing the romance and adventure of our cruise vacations into millions of viewers’ homes for the decade it was on air. 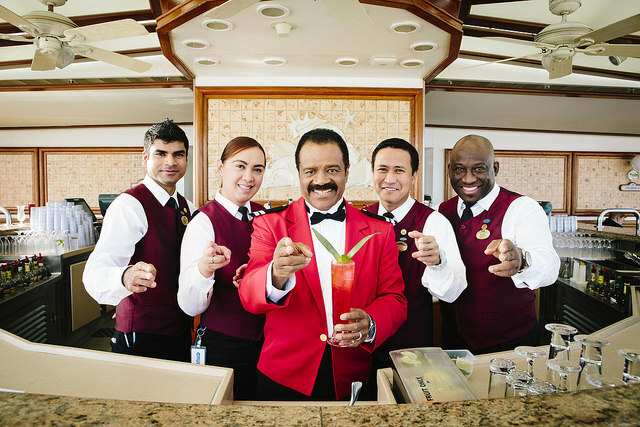 So, who better to create a special cocktail celebrating love and romance at sea than Ted, who turned his character into the world’s most famous bartender,” said Rai Caluori, the line’s executive vice president of guest experience and product development. “The Isaac” is the line’s latest new onboard offering furthering Princess’ love quotient. Last fall, the cruise line unveiled “Chocolate Journeys,” an enticing array of onboard chocolate offerings including custom-crafted desserts, chocolate and wine pairings, and exquisite chocolate bites created by one of the top names in artisan chocolate, Norman Love. Fill highball glass with 2/3 ice or desired amount of ice. Into a cocktail shaker, add ice, white rum, pomegranate syrup and lime juice. Shake and strain into highball glass, filling just to the top of the ice. Top off with club soda and garnish with a fresh lime slice and two pineapple spears. Princess launches biggest ever sale – line celebrates 50 years!